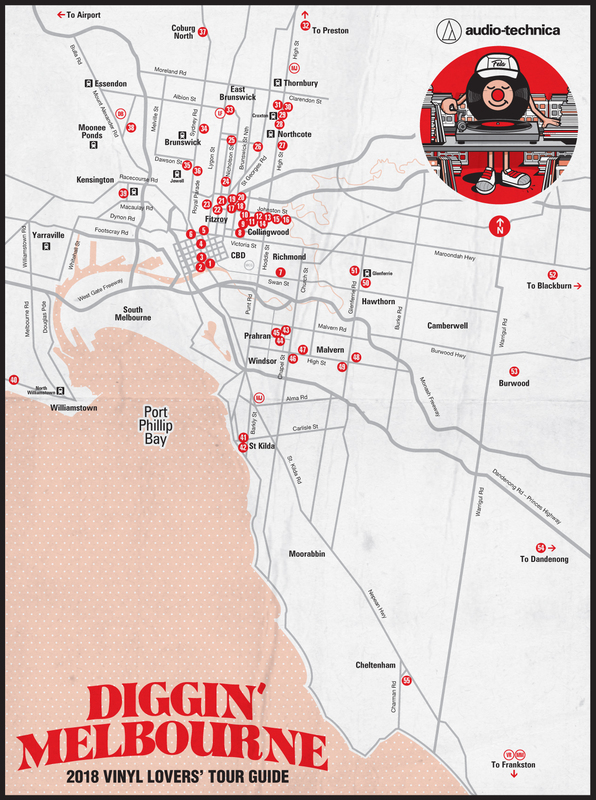 The 2018 Diggin’ Melbourne Map is out now and ready to assist your Record Store Day adventures. If you haven’t already picked up a printed map or perused the online store guide and PDF Download you still have time. Our new map features 55 stores and a unique Melbourne Record Stores Bus Tour; the website includes more than 60 stores, all located within Greater Melbourne. New stores included in the new map are Lulu’s (Carlton), Vinyl Revival Brunswick, Ricks Records (Collingwood) and Happy Valley (Collingwood). The only store to close in the last 12 months is Son of Run (Belgrave). As usual our online guide features some extra stores. This year we have more Bonus Digs than ever – including Vinylrules Music (Mordialloc), De Bretts (Moonee Ponds), Mainly Jazz (St. Kilda), Music Jungle (Thornbury), Metal Mosh (Frankston) and Lost & Found Market (Brunswick). Many of our featured stores have big plans for Record Store Day. Depending on where you are located there are numerous ways to attack. If you’re in the city, Wax Museum, Off The Hip, Rocksteady, Basement Discs and Heartland all have performances, guests, RSD releases and more. A short tram ride to the North is Melbourne’s Record Store Day epicentre. Fitzroy, Collingwood, Abbotsford and Carlton will all be going off! There are multiple performances at Northside Records including The Bamboos, Record Store Day mayhem at The Searchers, performances and exclusives at Plug Seven, new vinyl galore at Happy Valley. Brunswick Street has Polyester, Dixon’s, Vinyl Revival and Poison City all only a few metres apart – and all doing something special for Record Store Day. Still in the same neighbourhood you can visit Strangleworlds and Oh! Jean, or head to Johnston Street for more high-density digging, including Skydiver, Ricks, Vinyl Space, Dutch Vinyl and Hub301. A little further North heading up Nicholson Street is another cluster of stores – Goldmine in Carlton, Lulu’s in Carlton, Goldmine’s second store in North Fitzroy – then across to High Street where you can visit Rathdowne Records, Records Etcetera, Thornbury Records, Multisonics, High on Vinyl and Music Jungle, all of who have and abundance of treats in store. Still Northside – Record Paradise in Brunswick has their usual array of RSD performances and celebrations. Close by is Vinyl Revival, and heading further North is the legendary Round & Round Records and onwards to Round Again, Muscle Shoals and Hunter & Co. If you’re Westside there will be things to do as well. White Rabbit in Kensington will be celebrating, Essendon Secondhand will be open and doing what they do best; across in Williamstown you can visit Lost Ark where there is always some fresh stock at this time of year. Southside? Of course, Greville Records will be hosting live performances and have loads of RSD releases. Across the street pop into Profile for your club and dance sounds, or head down to Bounce Audio for your electronica fix. Also in Prahran/Windsor Union Heights have a big day planned with DJs and live performances throughout the day. Licorice Pie is the next stop – and assured to have records worth stopping for! Also Southside you’ll find Vicious Sloth and Quality Records in Malvern, Eclectico and Readings in St. Kilda. Further South you can visit Vinyl Solution, Vinylrules and Metal Mosh. There are also celebrations in the South-East. If you’re in Hawthorn/Camberwell you should visit Alley Tunes or Readings where you’ll find special releases and like minded people! No matter where you are there is a ‘INDEPENDENT’ record store close by. On International Record Store Day make sure you support your local independent record store and local artists & musicians. Visit the store guide for links to all the stores + addresses and trading hours. Happy Diggin’. The new maps are almost compete and will hit the streets early next week – just in time for Record Store Day. Watch this space. There are a couple of new stores in Melbourne and you can find them online in our store guide. Complete web updates next week to coincide with Official Map Release. We’re also having a party to celebrate. Join us at Belleville on Thursday April 19 to get your map before Record Store Day. Record Store Day is fast approaching. This year we’ll be celebrating on Saturday April 21, and as always there will be a new map in the week leading up to Record Store Day. If you own a record store and are not included on the current map please contact us to become involved. We are aware of several new stores in Melbourne and will endeavour to contact everyone in the new few days. We are again pleased and thankful to have Audio Technica’s support for Diggin’ Melbourne and Diggin’ Sydney. More news about events, prizes, new maps and website updates coming soon.